The corn stalk nitrate test (CSNT) is an end-of-season evaluation tool for N management for 2nd or higher year corn fields that allows for identification of situations where more N was available during the growing season than the crop needed. Where CSNT results exceed 3000 ppm for two or more years, it is highly likely that N management changes can be made without impacting yield. The summary of CSNT results for the past nine years is shown in Table 1. For 2018, 54% of all tested fields had CSNTs greater than 2000 ppm, while 44% were over 3000 ppm and 26% exceeded 5000 ppm. In contrast, 15% of the 2017 samples were low in CSNT-N. The percentage of samples testing excessive in CSNT-N was most correlated with the precipitation in May-June with droughts in those months translating to a greater percentage of fields testing excessive. As crop history, manure history, other N inputs, soil type, and growing conditions all impact CSNT results, conclusions about future N management should take into account the events of the growing season. In addition, weed pressure, disease pressure, lack of moisture in the root zone in drought years, lack of oxygen in the root zone due to excessive rain, and other stress factors can impact the N status of the crop. Within-field spatial variability can be considerable in New York, requiring (1) high density sampling (equivalent of 1 stalk per acre at a minimum) for accurate assessment of whole fields, or (2) targeted sampling based on yield zones, elevations, or soil management units. The 2018 expansion of adaptive management options for nutrient management now includes targeted CSNT sampling. Work is ongoing to evaluate use of yield to CSNT-N ratios to identify situations where yield was limited by factors other than N supply. Two years of CSNT data are recommended before making any management changes unless CSNT’s exceed 5000 ppm (in which case one year of data is sufficient). 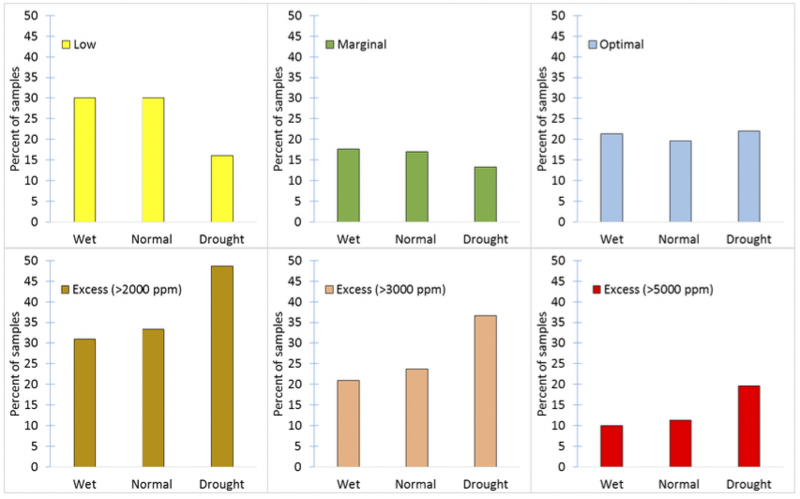 Figure 1: In drought years (determined in this analysis by May-June rainfall below 7.5 inches; which occurred in 2012, 2016, and 2018), more samples test excessive in CSNT-N while fewer test low or marginal. Instructions for CSNT Sampling; Cornell Nutrient Management Spear Program: http://nmsp.cals.cornell.edu/publications/StalkNtest2016.pdf. Corn N Calculator (CNC) N rates based on realistic yields expectations were on average 59 lbs N acre-1 higher than Adapt-N rates, but did not result in yield increases. Adapt-N nitrogen (N) rates led to 58% (clay loam) and 68% (loamy sand) less nitrate leaching compared to CNC N rates. Adapt-N rates resulted in savings of $29 acre-1 compared to CNC N rates. The over-application of nitrogen (N) fertilizer leads to large environmental problems and represents a considerable financial cost to the farmer. Despite these issues, farmers tend to over-apply nitrogen due to the difficulty of predicting the economic optimum N rate and the need to ensure high yields. 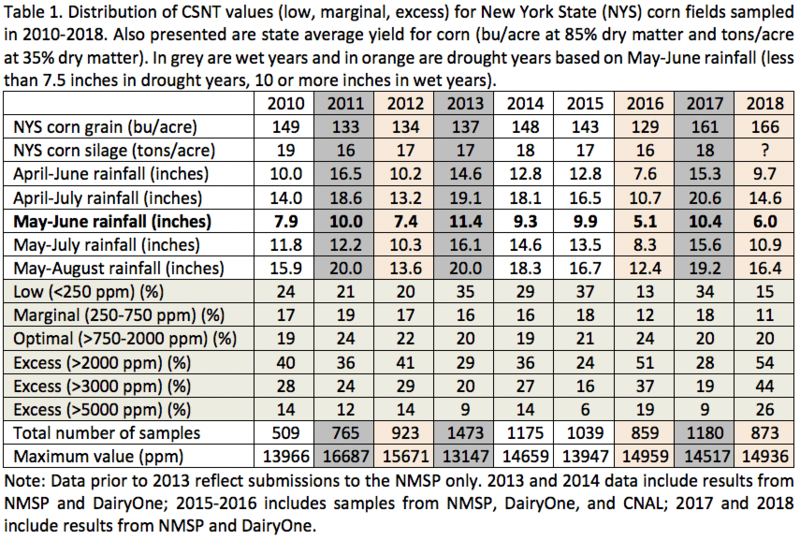 Static N rate tools, like Cornell’s Corn N Calculator (CNC; http://nmsp.cals.cornell.edu/software/calculators.html), are promoted widely but don’t capture the dynamic interactions between site-specific weather, soil, and management variables. Adapt-N (http://www.adapt-n.com), a dynamic-adaptive N recommendation tool, was designed to integrate real-time weather and site-specific soil and management data to predict the optimum N rate. In previous studies, it was demonstrated that Adapt-N can produce comparable yields to static N models and grower selected rates, while reducing overall N inputs (What’s Cropping Up article on comparing static and Adaptive N Tools; What’s Cropping Up article on comparing Adapt-N and CNC Tools). Yet no field experiments had been conducted to compare the effects of Adapt-N and a static N calculator on measured nitrate leaching. This study utilized two long-term tillage experiments to measure the effects of modeled N rates (Adapt N vs. CNC), soil type (clay loam vs. sandy loam), and tillage practices (no-till vs. plow-till) on nitrate leaching. Adapt-N and CNC nitrogen recommendations were superimposed onto two long-term tillage experiments (plow and no-till) at the Cornell Willsboro Research Farm for four years (2014-2017). The trials were done on contrasting soil types, one on a Muskellunge clay loam and the other on a Cosad loamy fine sand. Nitrogen rates included 15 lbs N/acre as starter fertilizer and the rest was side-dressed approximately six weeks after planting. CNC N rates were calculated using accurate yield potentials for each plot at the two sites (default yield potentials in the tool are unrealistically low). Adapt-N recommendations were developed considering plot-specific soil textures, organic matter contents, rooting depths, crop rotations, tillage practice, crop cultivar and population, previous N applications, drainage, and yield potentials, as well as daily weather information and grain and fertilizer prices. Corn silage yield was collected each year by hand harvesting two 5 m corn rows at three locations per plot. Drainage water samples were collected on 14 dates between April 2015 and October 2017 (Figure 1) on dates when the drain lines discharged. Water samples were analyzed for nitrate, NO3–, and nitrate, NO2–, which we simply refer to as nitrate in this article because the nitrite fraction is generally less than 1%. The CNC tool calculated 59 lbs acre-1 higher average N application rates than Adapt N (186 vs. 127 lbs N acre-1; Table 1). There were only two instances (both wet seasons on the clay loam soil) where Adapt-N predicted higher N rates than the CNC tool. Soil type had a very strong effect on corn silage yield, which were 2.37 tons acre-1 higher in the loamy sand plots than the clay loam plots. Despite a lower yield potential for the clay loam site, the mean recommended N rate for that soil was 17 lbs acre-1 higher than the loamy sand site. This indicates that both N tools assume a lower nitrogen use efficiency (NUE) for finer textured soils. While CNC N rates were much higher than Adapt N rates, they did not result in increases in yield (16.28 vs. 16.30 tons acre-1; Table 1). We found no relationship between N rate and yield as equally high yields were achievable at 100 lbs N acre-1 with Adapt-N as with CNC rates higher than 180 lbs N acre-1 (Figure 1). The Adapt-N rates resulted in calculated savings of $29 acre-1 (based on a fertilizer price of $0.50 lb N-1) compared to the CNC N rates since yields between the N tools were indistinguishable. Soil type and N Tool were important drivers of nitrate leaching in this study. 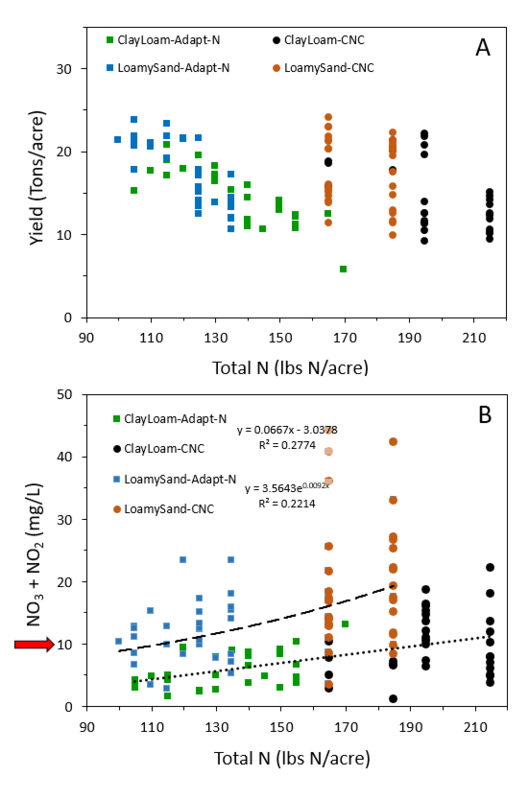 Nitrate leaching averaged two times higher in sandy loam soils than clay loam soils (16.47 vs. 8.34 mg NO3–+NO2– L-1; Table 1) despite slightly higher N rates for the clay loam soils. This “missing” nitrogen in leached waters under the clay loam soils suggests that denitrification is an important N loss pathway in these finer textured soils, which is a well-documented phenomenon. In addition to higher fertilizer costs per acre, CNC N rates led to 58% higher nitrate leaching in clay loam soils (10.32 vs. 6.55 mg NO3–+NO2– L-1) and 68% higher nitrate leaching in loamy sand soils (20.69 vs. 12.29 mg NO3–+NO2– L-1) compared to Adapt-N (Table 1). Increases in nitrate leaching were proportionally larger than the increases in N rates (46 % higher for CNC than Adapt N for clay loam; 43% higher for loamy sand). This pattern indicates that N rates above the optimum have disproportionately large environmental impacts. Also, average nitrate concentrations in leached water under CNC plots exceeded the U.S. EPA drinking water standard of 10 mg NO3– L-1 for both soil types. But nitrate concentrations under Adapt-N plots only exceeded the EPA standard at the loamy sand site. Despite high variability in nitrate concentrations at different sampling dates, there was a positive relationship between N rate and nitrate concentrations in leached water (Figure 1). The exponential relationship suggests that nitrate leaching is more sensitive to increasing N rates on loamy sand soils than clay loam soils (Figure 1). We noticed that extremely high nitrate concentrations (> 50 mg NO3–+NO2– L-1) in leached water in loamy sands occurred after long dry periods (e.g., in the 2016 growing season) under CNC N rates, but not Adapt-N rates. Tillage effects were modestly significant and on average the mean nitrate concentrations were 45% higher for the plow than no-till in the clay loam and 5% higher in the loamy sand. This study compared the static Corn N Calculator and Adapt-N and showed that the CNC seriously over-predicts the optimum N rate when based on realistic corn yields because the higher N rates did not result in yield benefits. Use of Adapt-N led to savings of $29 acre-1, reduced nitrate leaching by between 58% (clay loam) and 68% (loamy sand), and helped keep nitrate concentrations in drain water below or near the U.S. EPA drinking water standard. Research was funded by the Northern New York Agricultural Development Program, USDA-NRCS, and New York Farm Viability Institute. The application of manure to an actively growing crop can improve the uptake of nutrients, with benefits to both the crop and the environment. The “Nutrient Boom” (Figure 1) is a new tool developed by Doug Young of Spruce Haven Farm and Research Center (Union Springs, NY) and partners that allows for the application of liquid manure to corn as tall as 7 ft. It applies manure through flexible hoses in a 120 foot swath with little damage to the standing corn. Mid-season manure application allows for greater flexibility in the spring for planting and can reduce runoff by delaying spreading to a drier part of the growing season. Two years of field trials were conducted to compare corn yield with mid-season manure application with yields obtained with inorganic nitrogen (N) application. Figure 1: The Nutrient Boom allows for manure application in standing corn. A trial was conducted in Union Springs, NY, in 2016 and 2017. There were two 120 foot wide manure treatments, each replicated three times: (1) No manure (control treatment); and (2) Manure (targeted rate of ~12000 gallons/acre). Within each manure treatment, six 300-foot long subplots were established that received the following sidedress N treatments after the manure was applied: (1) No sidedress N; (2) 35 lbs N/acre; (3) 70 lbs N/acre; (4) 105 lbs N/acre; (5) 140 lbs N/acre; and (6) 175 lbs N/acre. In 2016, one corn variety was used (PO157AMX). In 2017, each strip was split through the middle and planted to two corn varieties (DKC54-36AR and P0506). Corn stalk nitrate test (CSNT) samples were taken when the corn had a moisture content of about 35% dry matter (typical silage harvest time). The field was harvested for grain in both years. Yields were obtained from yield monitor maps calculated from 200-ft lengths in the middle 80 ft (40 ft per variety in 2017) of the plots to minimize the influence of adjacent treatments. Plots receiving manure mid-season averaged 181 bu/acre (2016) and 159 bu/acre (2017). The corn grown in these plots did not respond to extra N fertilizer regardless of rate. The corn in plots that did not receive manure responded to N fertilizer (Figure 2). Pre-sidedress nitrate tests taken prior to manure and inorganic N application indicated a response to N was likely in both years. Figure 2. Corn grain yields as impacted by mid-season manure application, fertilizer sidedress N rate and variety. Yield data obtained with a yield monitor. Conditions were extremely dry in 2016 and wet in 2017. Figure 3. Corn grain yield, Corn Stalk Nitrate Test (CSNT) and grain yield:CSNT ratio as influenced by N rate and manure application for 2016 and 2017 combined for plots that did not receive manure (yellow) and plots with manure addition (green). Because corn grown in plots that received manure was not responsive to extra fertilizer N, the most economic rate of fertilizer N (MERN) where manure was applied was 0 lbs N/acre. The MERN for the non-manured plots was 121 lbs N/acre in 2016, and 133 lbs N/acre (DKC54-36AR) and 143 lbs N /acre (P0506) in 2017, using $4.35/bu of grain and $0.32/lb of N fertilizer. Yield at the MERN averaged 157 bu/acre in 2016, and 122 bu/acre (DKC54-36AR) and 145 bu/acre (P0506) in 2017. Manure addition increased yield to 16-35 bu/acre above yields obtained at the MERNs with fertilizer N only. Results were similar both years despite large differences in precipitation between the two growing seasons. Of the two varieties planted in 2017, both performed similarly in the manured plots but P0506 responded more to the N in non-manured plots and used N more efficiently (MERN was 10 lbs/acre higher while yield at MERN was 23 bu/acre higher for P0506). The CSNT results (Figure 3) showed an increase in CSNT when N fertilizer was added beyond the MERN in plots that had not received manure, resulting in peak in grain yield to CSNT ratio just prior to the MERN. For plots that had received manure, this relationship was different, reflecting that additional N fertilizer could not increase yield but did increase CSNT values. 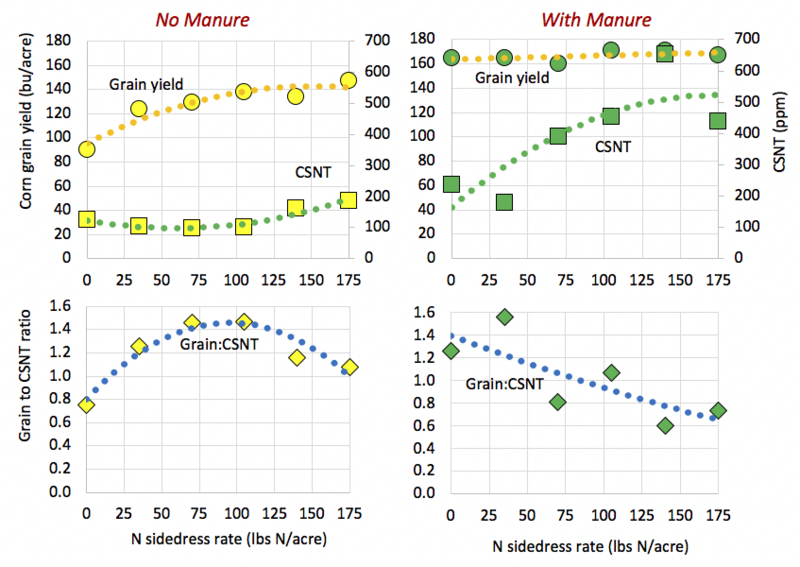 These results show two things: (1) the benefit of the manure application mid-season for overall yield of the field; and (2) the potential for both gains in yield and savings in N fertilizer costs with application of manure to fields that are N deficient. Manure application mid-season with the Nutrient Boom at rates applied in the study benefitted corn grain yield beyond what could be obtained with fertilizer in 2016 (dry year) and 2017 (wet year). Corn that was grown on plots that received the manure did not respond to sidedress N application in 2016 or 2017, independent of variety. Thus, manure applications were high enough to meet the crops’ N needs but N supply was not solely responsible for the higher yield. The higher yield and lack of response to fertilizer N in the manured plots suggest great potential for lowering of whole farm nutrient mass balances with manure application mid-season, especially for fields that are N deficient and would otherwise have needed a fertilizer N application. Future work should focus on rate calibration and control of the applicator and comparisons of impact of rates and timing of application on yield and N use efficiency. The current model was susceptible to clogging, but this is being addressed in the next version of the Nutrient Boom.